Convincing high-gain tones and noise suppression in one pedal. Built-in noise suppression works well. Low-gain sounds are nothing to write home about… But that's not what this pedal is for! Metallica’s Kirk Hammett previously told us that the Dark Blood is all over his band's Hardwired... To Self-Destruct and the record is a fitting debut for the firm’s “most evil” pedal yet. 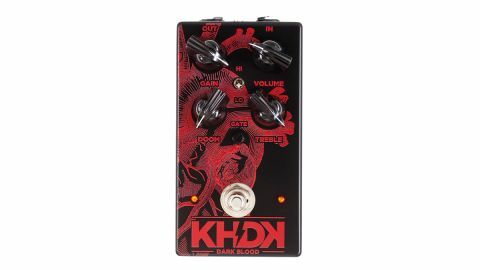 In contrast to the subtle graphics used in other KHDK pedals we’ve looked at, this one shouts loud and proud with a striking red embossed motif against its moody black casing. It’s a brutal-sounding thing, too, with a raging stack-esque delivery. Background noise is kept to a minimum with an onboard noise gate, but the big selling point is the Doom knob, which dials in a monstrous landslide of bottom-end for that crushing tone that Kirk’s bandmate James Hetfield is renowned for. The Hi/Lo switch adds to the tweakability with the Lo setting upping the grunt factor for rhythm and Hi boosting the top-end and sustain for lead breaks. We also love the treble control, which has bags of variation. To have all this power in one reasonably affordable pedal is a dream come true for metalheads. Add the Dark Blood into your rig and you’ll have the ultimate brutal metal attack. And when you’ve got your tone sorted, well, nothing else matters.